The right pane shows the output as you make it. 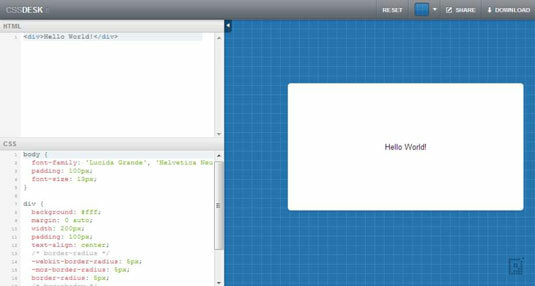 The default setup shows a simple Hello World example within a <div> element, but the editor works fine with any HTML code you provide. The HTML code appears in the upper left pane, while the CSS code appears in the lower left pane. The main focus of this editor is creating the user interface for your application. However, you can modify the HTML pane to include <head> and <body> elements. Styles you create in the <head> section will appear in the output, just as if you had created them in a standard document.